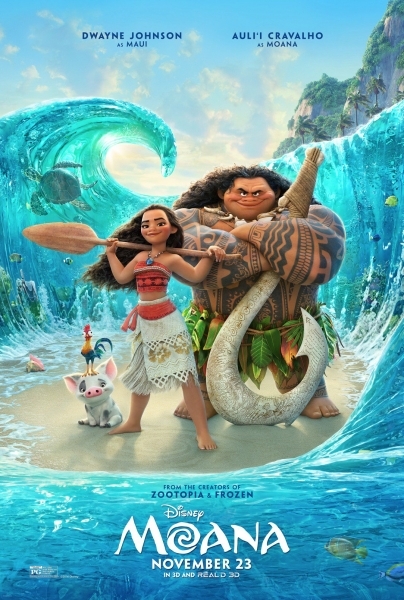 Moana is the 56th Disney 3D computer-animated feature film. The film/musical was directed by Ron Clements and John Musker, and the featured music is written by Opetaia Foa’i, Lin-Manuel Miranda, and Mark Mancina. The voice actors of the two main characters Moana and Maui are played by Auli’i Cravalho and Dwayne Johnson. The beginning grabs the attention of the audience and strategically paints the setting as baby Moana is projected on the screen. All the characters are introduced at the beginning and everything is well explained and easy to follow. As Moana grows up, the obstacles she faces help us to reflect on our lives. Moana, a unique and ambitious character inspired many people to do what they believe in. Her courage and strength made the movie uplifting and exciting as the she fought through the obstacles thrown her way. Although people questioned why Moana’s actions made her the heroine of the story and not the powerful ocean that was her sidekick, the overall fantasy movie provided a reality aspect. The storyline provided a clear pathway and plot to follow for the targeted audience of little kids. Another reason why Moan was a phenomenal movie was because of its stellar. Every little detail was expressed naturally and had very instinctive movements, making the characters come to life. They also used CGI-adding much more detail to Moana’s hair and the waves of the ocean, which are very important to the movie. The CGI made the movie vibrant and more humanized, making the audience more immersed in the movie. Overall, Moana deserved its place as one of the best disney movies to have ever been produced. It allows for all people to enjoy and sets up a great story line that anyone can understand and learn from. Moana was not just a movie but a powerful lesson that everyone can learn from. It is great as it inspires people to further their growth in life.